The 1940s Experiment in the Press! TBA- Feature article in Waitrose Weekend Magazine. TV Series – Four in a Bed. Want to go to war on your weight? Try the ration book diet! An article in the Czech Republic! 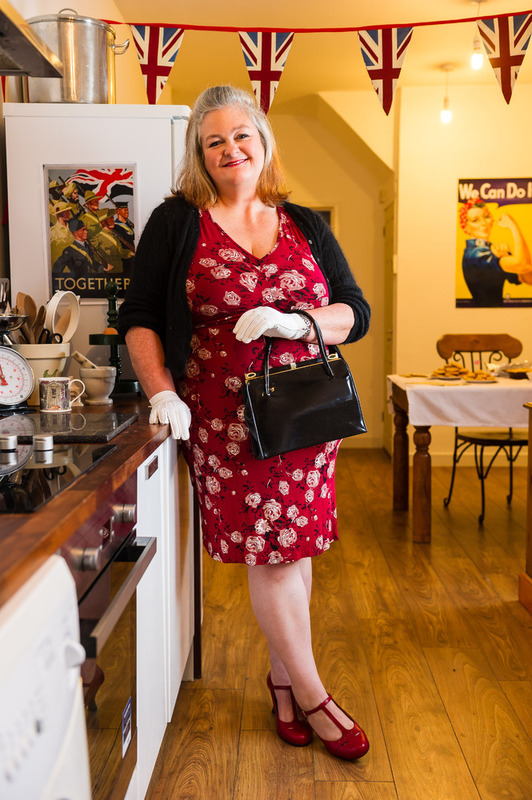 Would a Wartime Diet Help our Waistlines? The 1940s Experiment on Other Blogs! Dear Carolyn — I am writing this from Japan. Your wartime recipes all look so yummy. I have a question for you. There is an interesting tv program in the United States in which I got interested in the wartime German food. I thought you may be the best right person to ask. It reads: ” (in 1943) Christmas came with sacrifice this year. Food rations had been tightened. Butter, meat, sugar and coffee were replaced with imitation foods, some made with potato meal or wood pulp. But for German troops in the East (Russia), it was much, much worse.” Here I wonder what “potato meal” exactly was, and what “wood pulp” was used for. Was it really a substitute for one of those food (butter, meat, sugar or coffee)??? If you know something, could you please let me know? Wood pulp for eating? Unbelievable… Thank you for your time. Will keep reading your blog. Dear Atsubo- I do apologize for my tardy response. You have raised a very interesting question which I have to admit at this time I cannot answer although now you have asked it am determined to find out!!!! I wonder if you found out any more information on this since you wrote your question? Thanks so much for reading my blog- it encourages me no end seeing folk take an interest in the experiment! German food, We would’nt want any of that sort of thing. Ah, now there’s a narrow-minded attitude (from Capt Mainwaring). If you were starving and a German offered you food, whether it was war-time or not….you’d eat! I take great offence to your comment as I was born in Germany, grew up on German food here in Australia thanks to my Mum’s traditional cooking and can I just say, German food is DELICIOUS! I am 33 years old and even back in the 1980’s in primary school I was teased for being a ‘Nazi’ …….just because my Grandfather’s were forced to fight under conscription, that somehow makes me personally responsible for what Hittler did?! The war was nasty, food is awesome, get over your attitude. different way… No rush, but please let me know whenever you find a probably answer. Hope you will meet someone who emembers the food life from the 30’s and 40’s someday. I believe the bread was rather dry and awful. I am listening to Nella Last’s War on my Ipod, and it is a diary from that time. Nella talks about it. However, in the news here in the US, not so long ago, it was made known that some breads contained wood pulp to increase fiber. I don’t have any documentation to back this up but I’m guessing potato meal is simply potato starch. It would likely have been a cheap and more plentiful source of carbohydrates and an easy way to add bulk to baked goods. And as far as a coffee substitute, chicory root has long been used in this manner. It’s still sometimes added to coffee for a flavoring in the southeast US. Your information and ideas all make sense. Wood pulp to increase the fiber. “Potato meal” simply meaning “potato starch”, to increase carbohydrates and bulk!!! I looked “meal” in a dictionary and yes, “meal” means “ground” or “grits”. It didn’t occur to me… I also like chicory in my coffee. I thank all of you, Lori, Beti and Caroline. I don’t know about the potato meal (perhaps less processed than our potato starch?) or the wood pulp, but I do know that a variety of roasted ground roots or grains have been used to replace or extend coffee–chicory being one of them. I’ve even heard of using blanched, toasted acorns. Capt Mainwaring’s comment is just a wee joke based on a tv show called Dad’s Army .A comedy on the inefficient group of pensioners ” ready ” in the loosest sense to defend Britain against invasion so don’t worry about him , if it is a him , having an attitude .Don’t be quick to take offence , though I understand where the problem might lie . I really enjoy your blog and think you are doing amazingly! I wondered what yoour thorghs on Juicing are, I watched Hungry for Change aswell and really enjoyed it but im trying to figure out for myself how it all fits in with the 1940s diet because thats what id like to follow and wanted to ask what you think? If you decide to to juice your daily fruit and vegetables then I think that is awesome! I think perhaps by juicing you can get lots of greens/nutrition in and to me that can only be applauded! I juice some of my foods like spinach, kale and some fresh fruits although I like to make a smoothie from them as I like all the pulp/fibre as it fills me up. PS Yes the full movie/documentary at http://www.hungryforchange.tv is excellent and Fat Sick and Nearly Dead was very good too. so sorry meant to spell check before hitting send! Can you add me to your mailing list please.